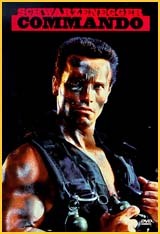 Commando is the first movie that comes to mind when you take the name Arnold Schwarzenegger. It is this movie that built up the big guy's action image. But the movie in its present avatar is nothing but a shadow of its former self. The reason? It has been dubbed into Hindi in the usual atrocious manner. The story and the scenes, with all the big guy's stunts, are of course left intact. But you just can't digest Arnold saying, "Maine usse chhod diya!" in a stupid, ineffectual voice, whereas the original dialogue "I left him" when he has actually just dropped a guy down a cliff makes you roll with laughter. There are scenes in the original English version where Arnold delivers his trademark one-liners with that deadpan expression of his. But here the one-liners are funny purely because they sound so ridiculous. The story has Col. John Matrix, retired commando, living in a forest with his lovable 10-year old daughter. But things go awry when his daughter is kidnapped by his former rival, Bennet, who is now working for the ex-dictator of a Latin American country. Bennet wants Matrix to kill the President of the Latin American country so that the dictator can take over. But when you push a man like Matrix so far, you gotta be careful. Matrix is put on a plane with a goon to finish his task. But he kills the thug with a blow and escapes off the plane even as it takes off. He has time until it lands, that is about 24 hours, to rescue his daughter. He must follow the clues he has and get to his daughter in time. He is helped by a charming stranger, Cindy (Dan Hedaya), whom he initially holds hostage for her car. The story traces Matrix's efforts to trace his daughter, leading finally to the ex-dictator's hideout where Matrix kills all the bad guys, blows up the whole place and rescues his daughter. Amazing stunts, mind-blowing action, funny dialogues... in short, vintage Arnie. But I'm sure you'll be much better off watching the original English version, even if it is only on a video cassette. Anything is preferable when compared to the horrible dialogues you have in the Hindi version. Otherwise the vision of Arnie saying, "Main tumhara sabse bura sapna hoon!" will haunt you in your dreams! Be the first to comment on Commando! Just use the simple form below. fullhyd.com has 700,000+ monthly visits. Tell Hyderabad what you feel about Commando!